It was a “10” on the Mellish Meter today which meant more outdoor painting projects on this beautiful Wednesday. 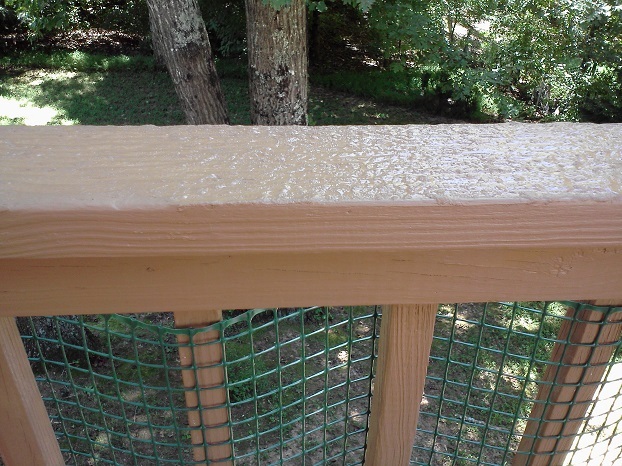 We had livened up our deck with some Rust-Oleum Restore textured paint that was cracking, flaking, and peeling in less than two years. 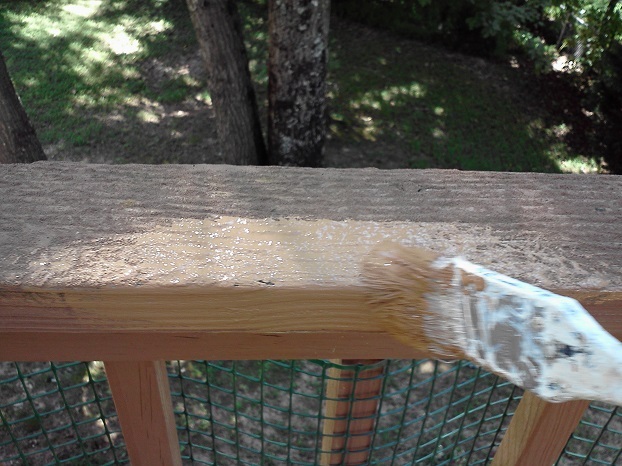 The plan was to quickly brush over the bad areas with a matching companion product (Rust-Oleum Restore Stain) and bring back that “new deck feel”. I found out (while typing this blog post) that we’re not the only ones with this problem. There was a class action lawsuit formed against the company only a few months back….so I’m guessing it is probably because we followed the instructions and, against my better judgment, didn’t pressure wash beforehand. But from the looks of it we got pretty lucky compared to others! I started the Rust-Oleum Restore project during the baby nap. And realized I can paint forever on a gorgeous day. I was after every nook and cranny and the little under-parts we missed the first time around. Any excuse to keep brushing in the crisp fall air. But when the baby woke up, she sent several sad little pleas (“Mommy? Mommy!“) through the monitor to flutter my heart, unsteady my hand, and quadruple my pace on the homestretch. So again, probably not my best work at the end. I painted barefoot and tracked some Rust-oleum Restore into the kitchen when I hurried in to wash up and get the baby. This left a temporary (until scrubbed) artistic brown haze of bare foot prints on the anti-fatigue mat in front of the sink. And I didn’t move a single flower pot. Here’s the finished look. Not quite dry but no more peeling! Hopefully it will help seal it down for another couple of years. This is project 3a of 5 of “A Fall Weather Project a Day (and a blog post) for a Week.” Read about Project 1 here and Project 2 here and Project 3b here.